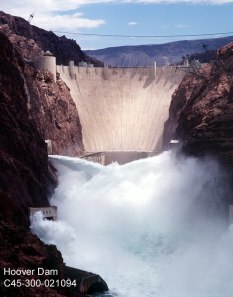 Hoover Dam is situated in Black Canyon on the Colorado River, near Las Vegas, Nevada. The massive dam is 221 m (726 ft) high and 379 m (1244 ft) long at the crest. The reservoir formed behind the dam, Lake Mead, is one of the largest artificially created bodies of water in the world; it covers an area of 603 sq km (233 sq mi), and its shoreline measures 885 km (550 mi).